Condition is Used and very good condition. 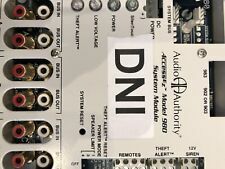 New ListingAudio Authority AccessEZ Model 980 System Module *Must See* L@@K! For sale is a great working condition of Audio Authority AccessEZ Model 980 System Module. For sale is an Audio Authority 9A60A RGBHV to YPbPr converter. The PC I use this with has died so I don't have a use for it anymore. You get only the unit. All this over just two inexpensive, easy to install Cat 5 cables. The Model 9880T Cat 5 Transmitter distributes HDTV signals up to 1,000 feet from the source to any of threereceiver options. Audio Authority 9880T Enclosed Transmitter - Component Video / Stereo & Digital Audio Transmitter for Dual Cat-5 Distribution. Up for sale is an Audio Authority Universal Distribution Amplifier, model 985U. Model is used but functions perfectly. Requires 120v AC power supply. AC adapter is also included. The selector is used, but it works perfectly as new. Very nice, basically new Audio Authority HDMi signal Amplifier / Splitters, model 1398D, with power cords. There are three (3) available. Low hours as these were quickly replaced by a much larger system. New ListingAudio Authority AccessEZ Model 932 Speaker Selector *Must See* L@@K! For sale is a great working condition of Audio Authority AccessEZ Model 932 Speaker Selector. Audio Authority HD-IP™ Gigabit Video Distribution Receiver Model 2811. removed from a working environment . New ListingAudio Authority AccessEZ Model 922 Low Level Selector *Must See* L@@K! For sale is a great working condition of Audio Authority AccessEZ Model 922 Low Level Selector. HIGH END CLEARANCE SPECIAL. **LOOKING TO SELL UP TO (12) UNITS! The 9850's buffered bus and special cable length compensation circuitry eliminate common bandwidth losses associated with long coaxial cable runs. This allows bus cable runs of up to 500 feet. You can expect excellent HDTV picture clarity and high quality digital audio in your showroom with the 9850. Audio Authority 1322D. Model 1322D. Installs in HDMI signal path after source device. Supports HDMI 1.3 and DVI 1.0 signals. I/O Connectors: HDMI female, Type A. We know how important it is to be able to get help when you need it. This item shows the normal signs of use as can be seen in the photos. The 1109A IR jacks are isolated from all other system wiring and can therefore be used for any kind of low speed signal suited for Category 5 cable conductors. New ListingAudio Authority AccessEZ Model 930 Demonstration Network *Must See* L@@K! For sale is a great working condition of Audio Authority AccessEZ Model 930 Demonstration Network. High bandwidth component video pathways handle up to 1080p resolution, while analog audio, digital optical, and digital coaxial audio are also supported. Audio Authority 1185ci Multi-mode HD Distribution Amplifier. Audio Authority 1360. Audio Authority 1360 HD Component Downconverter. With a smaller form-factor and a lower price, the 1360 HD Component Down-converter is an ideal choice for applications that do not require that advanced features of the1361. The Model 9880 is perfect for wall-mounted displays. Cable connections are parallel to the wall, allowing near-flush mounting for flat panel displays. The 9880 can be mounted on any flat surface, even to the back of a TV when no wall surface is available. Audio Authority 1180R Enclosed Receiver. Audio Authority 1180R Enclosed Receiver - Component Video / Digital Audio Receiver for Single Cat-5 Distribution Systems. The 1180R requires only one Cat 5 style twisted-pair cable.